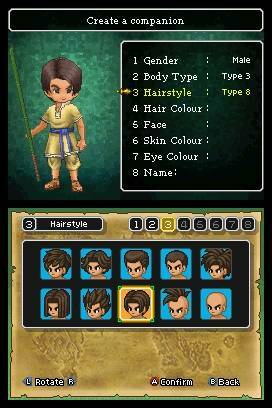 When Square-Enix announced Dragon Quest XI, it was a bit of a surprise for many that the newest entry in the core series of the game would be on the Nintendo DS. Normally handheld iterations of a series are spin off titles or side stories, so it was considered a bold move to begin with. Not to mention this new title boasts a multiplayer co-op party for the main game. The game sets up the player as a “Celestrian” – an angelic-like race that live above the human world. Where all train to one day become a guardian and gain goodwill of their human charges, which menefests itself as an energy that can be used to power the towering tree that powers the Celestrians temple. Things go awry however, and the player ends up crashing to earth, losing their halo and wings in the process. Then begins a quest to figure out what happened and how to regain what you lost, helping people along the way. On first impression, the graphics for the game are quite stunning for a DS game, the entire game world is in 3D, and while it’s still low-polygon graphics, the lovely textures and designs of each location more than make up for the graphical power the DS lacks. The world is also set into sizable chunks and isn’t too hard to navigate, there are no really nasty surprises if you venture too far off the beaten path in early sections (in fact there are lots of nice goodies to find in hidden sections of the game). The battle system is you usual turn-based system, your character has a choice of physical and magical attacks which change depending on the “job” class of your character and allocation of skill points. It’s a complex system that’s nicely simplified, so the player doesn’t get too bogged down with the stats. Clothing also adjusts general stats so your character’s wardrobe plays a part in battle too. 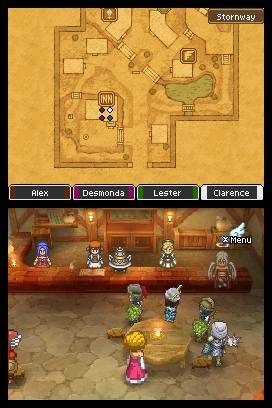 In terms of play, Dragon Quest is quite a player friendly RPG, while some games roll you back to your last save after being defeated (losing exp, items and additional items), the worst Dragon Quest does on defeat is take half your money and throw you back to the last village you saved in (this is also true generally in the series). The game also goes lengths to make sure the player is never lost, with characters clearly telling you where to go next, fairly quick and painless tutorials on the various features available and even a quest list to remind players what side-quests they are doing, and the important details of each one. As a result the game can serve as a fairly friendly introduction to RPG’s as well as a friendlier jaunt for more seasoned gamers. The only problem with Dragon Quest XI is it doesn’t offer much new to the RPG genre bar the large amount of customization, the multplayer has already been dabbled with by Square-Enix before. So if you are looking for a fresh brand new gaming experience, this title won’t offer anything you haven’t seen before. It’s a pure old fashioned RPG at heart, though it covers the basics very well and offers a solid gameplay experience. Theres a lot of back and forth between the various cities in the game too, thankfully however, there is a common item that allows you to instantly transport anywhere you’ve already visited. 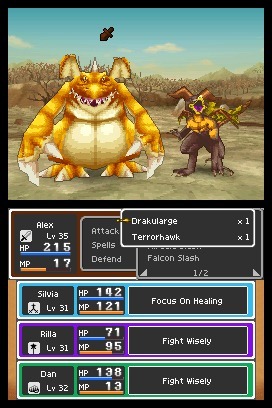 Dragon Quest is a great handheld title; it has wonderful visuals, some great character design and easy to use controls and options. It manages to be an appealing starting point for more casual players, while retaining enough of the basic RPG spirit. The multiplayer certainly makes it all the more appealing and the game offers plenty of rewards along the way. The story is compelling enough too, which plenty of characters to interact with and lots of side quests to do in addition to the main story. Previous Previous post: Off Topic: Sackboy Merchandise – Finally! Next Next post: Lady Geek TV – Episode #12: Are Smartphone Apps for Twitter Up to the Job?